An old robot named H-34-RT wakes up in a derelict space station orbiting his home planet. His civilization was destroyed long ago by evil O'Xelg, but he has yet to figure that out. After an initial shock, he decides to follow his old defense routines: that means fighting the invaders, even if he is alone now. 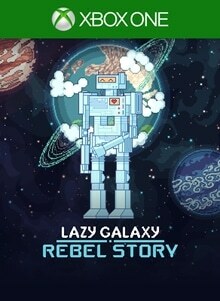 Lazy Galaxy: Rebel Story is a challenging, squad-based shoot-em-up/bullet hell roguelite. Fly through tons of bullets, defeat various enemies and engage challenging bosses, all this to help a lonely robot complete his mission.